Mitchell Hamline School of Law is built on a long, rich history of providing innovative, forward-thinking, and accessible legal education. Mitchell Hamline School of Law was formed in 2015 by the combination of William Mitchell College of Law and Hamline University School of Law. This extraordinary union brought together two law schools that have shaped Minnesota’s legal landscape for more than a combined 155 years, creating the top law school in the Midwest for students seeking a rigorous, practical, and problem-solving approach to legal education. At a time when many law schools are scaling back, Mitchell Hamline is growing and innovating. 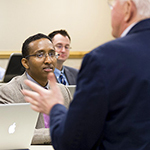 The law school offers nationally-ranked programs, an array of dual-degree and certificate programs, more enrollment options than any law school in the nation, and an alumni network of more than 19,000, the largest in the region. Mitchell Hamline traces its roots back to 1900, when five notable St. Paul lawyers had an entirely new idea for legal education. They founded a night law school for people who, because they were earning a living and supporting a family, needed an alternative to daytime law school. The founders pulled together a group of students, many of them clerks in their law firms, and taught the classes themselves, bringing a real-world, practical perspective to the classroom. That maverick law school, along with four other area schools that shared its practical sense, would eventually become William Mitchell College of Law in 1956. William Mitchell continued to develop its emphasis on practice-ready legal education and created a clinical program in 1973, one of the first schools in the nation to do so. It also developed leading-edge legal writing, advocacy, and practicum programs. At about the same time, Hamline University School of Law opened its doors as Midwestern School of Law with a similar commitment to real-world learning and accessibility. Hamline further established itself by taking a holistic approach to experiential learning, focusing on practice, problem-solving, and professional responsibility. Hamline became a top law school in the country for dispute resolution and health law, two programs that continually receive high national rankings. As they grew, both schools were responsive to the changing needs of students. William Mitchell began offering daytime classes and the option of full-time enrollment, as well as the nation’s first-ever part on-campus/part online enrollment option at an ABA-approved law school. Hamline created Minnesota’s first and only weekend law degree enrollment option, the second of its kind in the nation, making a legal education possible for hundreds of working adults across Minnesota. In 2015, the two law schools combined to form Mitchell Hamline School of Law—and the commitment to experiential learning, innovation, and accessibility became stronger than ever. Mitchell Hamline is a top law school for dispute resolution and health law and a nationally recognized pioneer in clinical programs. 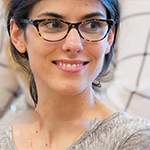 It offers a multitude of legal education programs, combining legal theory and training with other professions, such as business and public health. 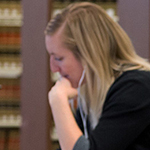 Always committed to access, the law school provides the most enrollment options in the nation. In addition to its full- and part-time programs, Mitchell Hamline has the only online/on-campus HYBRID J.D. 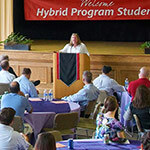 program at an ABA-approved school and is one of only two law schools to offer a weekend J.D. program. Mitchell Hamline’s 19,000 alumni are leaders in the profession, working in the state’s largest law firms, Fortune 500 companies, judiciary, government, and nonprofit organizations. More than half of all district court judges in Minnesota are Mitchell Hamline alumni. Standing on the shoulders of its founding law schools, Mitchell Hamline continues to shape the future of legal education, while always meeting the needs of our students and the legal community.